Google Scholar: As of January 21, 2019, I have total citations of over 5855 with an h index of 33. 55. “Effects of Project Changes and their timing of occurrence on Cost Performance” with J. Park. 55. Narbaev, T. and Kwak, Y.H. (2018) "Public-Private Partnerships Research: A Scientometric Profile Analysis" submitted for review, November 2018. 54. Suh, M.J., Pearce, A.R., Song, Y., Kwak, Y.H., Kim, J.I., and Zhang, Y. "The Impact of LEED-Energy Star Certified Office Buildings on the Market Value of Adjoining Building in New York City", Journal of Green Building, Winter, 2019, 31-51. DOI: 10.3992/1943-4618.14.1.31. ABSTRACT: Green building certification is a useful way to support objective evaluations of the sustainability of a building. Both the Leadership in Energy and Environmental Design (LEED) and Energy Star certifications are designed to reduce the negative environmental impacts of buildings and provide positive economic benefits to certified buildings. Given that a demonstrable positive economic impact is also required to satisfy one element of the triple bottom line of sustainability for these certifications, this study examined the economic impact of LEED and/or Energy Star certified office buildings on the market values of adjoining buildings in Manhattan, New York City (NYC), using a spatial analysis based on a Geographic Information System (GIS) and a statistical analysis utilizing R-Project. The study’s findings reveal a positive impact for LEED and/or Energy Star certified office buildings on their adjoining buildings, pointing to the need for future research to investigate the spillover effect of LEED and/or Energy Star certified office buildings on other buildings in their neighborhood from a socio-economic standpoint. 53. Choi, J.O., O’connor, J.T., Kwak, Y.H., Shrestha, B., "Modularization Business Case Analysis Model for Industrial Projects" Journal of Management in Engineering, 2019, 35(3): 04019004. DOI: 10.1061/(ASCE)ME.1943-5479.0000683. ABSTRACT: Modularization is a method of enhancing project value by exporting a portion of the site work to fabrication/assembly shops or yards. However, the construction industry has difficulties in identifying the optimum extent of modularization to maximize its benefits. Research Team 283 of the Construction Industry Institute (CII) developed a business case process to identify the optimum proportion of work hours to be shifted off-site by means of a module scope and identified modularization drivers. With the assistance of the CII’s Modularization Community of Practice (MCOP), this study developed a model that provides the practitioner with specific savings in addition to finding the optimum level of work hours to be moved off-site. The researchers also collected existing business case analysis models/tools from various companies and the available literature to identify the most acceptable or best-fitting elements. These elements were integrated into the new model, which was reviewed and validated by CII MCOP. This model will be applicable to various projects where decision making for modularization is difficult because of the absence of an assigned cost/factor/productivity for different parts of a module job. This research will add to the already-existing literature and research on modular decision-making practices. ABSTRACT: Conducting an early warning forecast to detect potential cost overrun is essential for timely and effective decision making in project control. This paper presents a forecast combination model that adaptively identifies the best forecast and optimizes various combinations of commonly used project cost forecasting models. To do so, a forecast error simulator is formulated to visualize and quantify likely error profiles of forecast models and their combinations. The adaptive cost combination (ACC) model was applied to a pilot project for numerical illustration as well as to real world projects for practical implementation. The results provide three valuable insights into more effective project control and forecasting. First, the best forecasting model may change in individual projects according to the project progress and the management priority (i.e., accuracy, outperformance, or large-errors). Second, adaptive combination of simple, index-based forecasts tends to improve forecast accuracy, while mitigating the risk of large errors. Third, a post-mortem analysis of seven real projects indicated that the simple average of two most commonly used cost forecasts can be 31.2% more accurate, on average, than the most accurate alternative forecasts. ABSTRACT: Project-based organizations are a unique organizational form where business activities are implemented and managed around temporary projects. The aim of this research is to better understand how project-based organizations manage and implement dynamic capabilities to develop, transform, and sustain their strategic advantage in a competitive global environment. This study reviews and synthesizes various theories in strategy and operations management and examines the global operational practices of two successful European engineering–construction companies to derive effective management strategies that reflect the theoretical aspects of dynamic capabilities. The findings identify three sets of theoretically and empirically grounded management strategies (i.e., diversification, decentralization, and value integration) that can help project-based organizations sense, seize, and reconfigure resources to successfully adapt to a dynamic business environment. This has led to a generic strategic framework and research propositions. This research extends a valuable theoretical lens, dynamic capabilities, to investigate the managerial challenges in project-based organizations. The proposed strategic framework and theoretical propositions not only offer important practical implications for project-based organizations, but also open a new interdisciplinary research area at the interface between dynamic capabilities theory and the unique project environment. ABSTRACT: This study proposes a conflict analysis framework to investigate how conflict occurs and what causes conflict by considering the characteristics of public infrastructure projects. The conflict occurrence process over construction projects was structured as four stages, based on the paradigm model approach of grounded theory. Two types of Korean cases, the first one is linear facilities and the second one is clustered facilities, were analyzed using the proposed framework. The study examined that each infrastructure type has its own pattern during conflict occurrences, with the impact of conflict factors also varying significantly. The results showed that “Procedure of deciding facility’s location and its route” is commonly extracted as a major factor. For linear infrastructure facilities, “the validity of the public engagement process” and “technical alternatives to mitigate conflict” were distilled as major factors. By contrast, “environmental and ecological concerns in the early site selection phase,” as the facility required a large amount of territory, was identified as more important for clustered infrastructure facilities. This framework is expected to be useful for conflict analysis from the early stage of public projects, according to the inherent characteristics of the given infrastructure project. 49. Kettunen, J. and Kwak, Y.H. (2018) “Scheduling Public Request for Proposals (RFPs): Models and Insights”, Production and Operations Management, 27(7), 1271-1290. DOI:10.1111/poms.12868. March 2018. ABSTRACT: We show that the schedule for contracting public procurements can impact the number of proposals and thereby the cost of procured services or products. This holds when the market for procurement contracts is not perfectly competitive, which is typically the case for large and costly public procurements. We formalize this previously unexplored operational level problem of scheduling procurement contracting and develop an optimization framework to solve it. For large problems we propose a hierarchical optimization heuristic. Furthermore, we develop heuristics that do not require solving optimization problems, such as (i) equal number with mixed cost scheduling heuristic and (ii) equal cost scheduling heuristic. We show that depending on the characteristics of the procurement contract scheduling problem either of these approaches provides nearly the same expected total procurement cost as the optimal schedule. We apply our optimization framework to the Florida Department of Transportation’s procurement contracts scheduling problems. We show that the optimized schedules are expected to yield significant cost savings over the actual schedules employed in practice. Our results have implications for public policy suggesting that the fiscal stimulus funds are cost-effective to allocate for many small projects instead of few large projects. 47. Li, Y. Lu. Y., Ma, L., and Kwak, Y.H. (2018) "Evolutionary Governance for Mega-Event Projects (MEPs): A Case Study of the World Expo 2010 in China" Project Management Journal, 49(1), 57-78. February/March 2018. ABSTRACT: A mega-event is an open socioeconomic system characterized by massive budget demands and multiple types of subprojects and their complex interrelationships. Although a mega-event is an opportunity for a country to show its international reputation, management capacity, and societal strength, it demands a long preparation time, an enormous amount of investment, and massive resource mobilization with far-reaching effects on both the economic and social development of a country. Mega-event projects (MEPs) face remarkable challenges in terms of overrun costs, delayed schedules, and political issues, indicating that the research on such mega-events is still insufficient and that there is a lack of effective theories to support the management and governance of MEPs. Existing studies have also ignored the dynamic evolution and adaptation of governance in a changing environment, particularly in relation to the success of MEPs. To fill this research gap, this study aims to examine the dynamic governance of MEPs on the basis of a new theory—evolutionary governance theory (EGT)—which combines institutional economics, systems theory, and project governance. The study was conducted in three main steps: (1) studying the case of the evolutionary governance of the World Expo 2010inChina during its life cycle stage, including planning, construction, operation, and post-event development; (2) discussing the impact of the hierarchical and cross-functional governance structure of the Expo; and (3) summarizing the theories and best practices of dynamic governance mechanisms for MEPs. The result of the study can deepen understanding of the multi-level governance of mega-events during the life cycle process and can also support the evolution of governance transition over the different stages. ABSTRACT: Alternative project delivery methods such as design-build (D-B) and construction manager/general contractor (CM/GC) or construction manager at risk (CMR) are typically used in conjunction with best-value or qualification-based procurement and guaranteed maximum price (GMP) or other payment provisions. Recently, a new hybrid contracting strategy called “competitive GMP,” in which an alternative delivery method combines with low-bid procurement and “open book” GMP payment provisions, has been used in the construction industry. The objective of this paper is to advance the understanding of the impact of the competitive GMP contracting strategy on project costs. The exploratory structured interviews were conducted to identify the perception of the owners and contractors on selecting a contracting strategy. Three empirical case studies were then performed to examine the cost implications on the competitive GMP contracts. The first two case study projects were delivered using the competitive GMP, and the third case study project was delivered using the conventional GMP. Each case study was analyzed using a proposed framework that captures the competitive behavior of contractors by evaluating cost and discounts related to direct work, contingency, and construction change orders throughout the project development process. The results showed that the competitive GMP projects generated cost advantages to the owner through various discounts provided during the procurement but did not always attain such saving advantages during the construction. This study contributes to a body of knowledge by examining a new approach to delivering construction projects. The findings from this study also provide guidance for owners and practitioners to better understand the cost implications of competitive GMP projects throughout the project life. ABSTRACT:Traditionally, conflict management in construction projects has focused on disagreement among internal stakeholders, such as employer, contractors, and subcontractors. However, as social consciousness and personal welfare demands increase, social conflicts among external stakeholders, such as local residents, local and central governments, and NGOs, have become more critical factors in enhancing project viability. In Korea, these conflicts have an impact of US $70 billion annually on social costs. To alleviate social conflicts and costs, this study aims to propose a conflict management framework based on twenty-two representative public construction projects. This study identifies and frames the various causes, impacts, and resolutions of conflicts through the case history of project viability. Through these findings, five types of conflict scenarios were derived: project termination, early mitigation, late mitigation, project enforcement, and late occurrence. Furthermore, this study suggests root causes, pathway of conflict propagation, and characteristics of each conflict scenario, which will assist project stakeholders in developing sustainable management for conflict solutions in line with each project's unique situation. ABSTRACT: Should public-sector owners use Design-Build or Design-Bid-Build to deliver projects? To seek answers to this question, this study tackles the following questions related to fundamental decisions in the procurement process: 1) for which project owners are likely to employ one delivery method or the other; 2) to which contractor owners tend to award Design-Build projects; and 3) how different the consequences of the decisions are between the two methods in terms of cost and schedule. Economic theories of contract selection suggest that Design-Build would fit better with large, environmentally-uncertain, and technologically-challenging projects, thereby, requiring better-qualified contractors. However, analyses of comprehensive data on public transportation projects in Florida reveal some misfits between theories and the reality. Regardless, Design-Build seems advantageous to schedule control, while cost advantages of one method over the other is still inconclusive. This study concludes with some implications of these findings for efficient deliveries of public infrastructure projects. ABSTRACT: The construction industry is beginning to utilize building information modeling (BIM), benefiting from the improved visualization and productivity, better coordination of construction drawings, building documents that contain embedded links to virtual information, faster delivery, and lower costs. However, construction companies often find it challenging to reorganize their company’s organizational structure to take full advantage of these benefits of BIM adoption and implementation. This study explores contractor’s transformation strategies that will enable them to successfully adopt and implement BIM for major construction projects. In-depth case studies from large contractors capture the benefits of BIM implementation, the appropriate organizational structure, the training and education program, the cost related to BIM implementation, including software and hardware investment, the relationship with other stakeholders, and the future recommendations to implement BIM for their construction projects. This study provides an overall framework and organizational transformation strategies for contractors trying to adopt BIM to maximize the potential benefits achieved in their projects and organizations. ABSTRACT: Little research has been conducted on how project-based organizations navigate internal and external pressures to develop and improve project competences over time. Using a cases study approach, this paper examines the development and implementation of project based organization over a period of 30 years. Overall, the evolution of project management competencies in the organization broadly followed the prevailing approaches in improving organizational management practices uncovered in review of literature. The organization’s capability to adopt and implement project management frameworks improved over time as senior managers became more masterful at matching improvement actions into the organizational context. This research also presents how a systematic approach of project management maturity models for identifying and implementing project management practices and processes can increase the effectiveness and comprehensiveness of overall management practices. The study concludes with a series of recommendations in further improving project management practices and processes in project-based organizations. ABSTRACT: The unprecedented Chinese urbanization leads to massive government-funded construction projects. In most cities, a special project management mode called “Agent Construction Model (ACM)”has been adopted to manage and govern these projects under the same umbrella of administrative standards. The ACM integrates all available government resources to complete the urbanization projects but meanwhile it faces great challenges from overwhelming complex information and information processing. This study presents the development of a city-level multi-project management information system to decompose the information processing complexity in the context of ACM management mode. The complex adaptive system and two specific development techniques—adaptive project framework and modularized functional design method—are introduced for the system development. The system was validated at a typical urbanization city in Changchun, China. This research complements the existing project information system by adopting complexity design principles and it also provides practical value for managing large-scale urbanization projects. ABSTRACT: Sustainable development represents a major challenge of the 21st century. Organizations use projects to implement strategic corporate objectives, exploring sustainable development from a project management perspective is imperative. While current project management techniques are well defined in terms of content and process to manage the budget-scope-time constraint, availability of organization resources and ability to adopt project governance strategies in a changing business environment, like incorporating sustainability in business process is ambiguous, literature has not explored how to cope with a normative situation like sustainability. We consider Small-to-Mid-Size-Construction-Organizations (SMSCOs), which makes up the largest portion of the project-based industry and are most impacted by new government regulations, as our population of interest. This paper addresses two primary objectives in relation to organizational resources available for SMSCOs: to identify an organization’s shortcomings in undertaking a sustainable project, and to identify means for improving organizational readiness to cope with governance of sustainable projects. A case study with a SMSCO to understand activities, resource availability, and how to improve organization readiness to undertake projects related to sustainability is discussed. A conceptual framework is presented for the adoptive project governance process to ensure resource constrained organizations like SMSCO’s can align better to govern such projects. 35. Choi, S., Kim, D.Y., Han, S.H., and Kwak, Y.H. (2014) “Conceptual Cost Prediction Model for Public Road Planning via Rough Set Theory and Case-Based Reasoning”, Journal of Construction Engineering and Management, 140(1), 04013026. DOI:10.1061/(ASCE)CO.1943-7862.0000743. ABSTRACT: Long-term transportation policies require government officials to predict the cost of public road construction during the conceptual planning phase. However, early cost prediction is often inaccurate because public officials are not familiar with cost engineering practices, and moreover, have limited time and insufficient information for estimating the possible range of the cost distribution. This study develops a conceptual cost prediction model by combining rough set theory, case-based reasoning, and genetic algorithms to better predict costs in the conceptual planning phase. Rough set theory and qualitative in-depth interviews are integrated to select the proper input attributes for the cost prediction model. Case-based reasoning is then applied to predict road construction costs by considering users’ difficulties in the conceptual policy planning phase. A genetic algorithm is also used to assist the rough set model and case-based reasoning model to obtain optimal solutions. The result of the analysis shows that the proposed conceptual cost prediction model is reliable and robust compared to the existing cost prediction model. 34. Kwak, Y.H., Walewski, J., Sleeper, D., and Sadatsafavi, H. (2014) “What Can We Learn from The Hoover Dam: that Influenced Modern Project Management?” International Journal of Project Management, 32(2), 256-264.DOI:10.1016/j.ijproman.2013.04.002. ABSTRACT: The Hoover Dam was completed two years ahead of schedule and under budget despite political, economical, technical, and organizational obstacles. Previous literature regarding the Hoover Dam project focused primarily on the aspects of design, engineering, and construction, with minimal analysis or discussions on project and program management techniques unique to this undertaking. This paper examines project and program management practices applied to the building of the Hoover Dam, and discusses how these factors contributed to the establishment and evolution of modern project management principles, tools, and techniques. A historical review of the Hoover Dam project reveals that the project team implemented a number of innovative strategies and practices that are comparable to critical success factors for today’s megaprojects to overcome monumental project challenges and obstacles. This paper conveys the organizational and managerial best practices and presents lessons learned associated with the planning and construction of the Hoover Dam project. ABSTRACT: The construction industry is one of the largest sectors in the US economy, yet little is known about the key macroeconomic parameters that affect its industry’s structure and performance. The main objectives of this research are (1) to analyse the macroeconomic performance of construction industry as a whole and at 14 of its sub-sectors in terms of labour productivity, gross margin, and worker's wages; and (2) to develop a quantitative model that predicts a firm's profitability by analysing various levels of labour productivity. The results of a non-linear regression analysis based on the comprehensive US Economic Census data show that the construction industry’s sub-sectors with the highest productivity are the most profitable with regard to the gross margins that they are able to generate. This study and its model will help decision makers better assess macroeconomic performance and conduct trend analysis of the construction industry to serve as a basis for developing strategic roadmap for the future. ABSTRACT: This study aims at providing an alternative view of users’ Enterprise Resource Planning (ERP) acceptance. Despite the large body of literature, there are still empirical inquiries to investigate the ERP system implementation from end-users’ perspectives as well as from different organizational contexts. To address these issues, we set a project-based sector as our population of interest and seek to understand how project management practices are interrelated with end-users’ cognitive perception, and in the end, with their behavioral intention of using the ERP system. In doing so, this study incorporates the best practices of ERP system implementation projects, internal support, external (consultant) support, and functionality selection, into the extended Technology Acceptance Model (TAM) that includes belief constructs and socio-environmental construct (subjective norm). The empirical analyses show that managerial practices and socio-environmental factor are significantly related to the original TAM variables in the context of ERP system. One of the interesting findings is the negative effect of consultant support on perceived usefulness, but positive effect on the perceived ease of use, suggesting a useful reference for future research. This study extends existing literature by investigating potential managerial and socio-environmental factors affecting user adoption behavior in a different organizational context. This study would also benefit project-based sectors by offering valuable managerial insights which enable them to appreciate and improve end-users’ ERP system acceptance and utilization. 30. Choi, K. Kwak, Y.H. Pyeon, J., and Son, K. (2012) “Schedule Effectiveness of Alternative Contracting Strategies for Transportation Infrastructure Improvement Projects” Journal of Construction Engineering and Management, 138(3), 323-330, DOI:10.1061/(ASCE)CO.1943-7862.0000431. 29. Kwak, Y.H. and Anbari, F.T. (2012) “History, Practices, and Future of Earned Value Management (EVM) in Government: Perspectives from NASA” Project Management Journal, 43(1), 77-90. DOI:10.1002/pmj.20272. 28. Choi, K. and Kwak, Y.H. (2012) “Decision Support Model for Incentives/Disincentives Time-Cost Tradeoff”, Automation in Construction, 21(1), 219-228. DOI:10.1016/j.autcon.2011.06.006. ABSTRACT: Offering contractors a monetary incentive for early project completion provides agencies with an innovative means to expedite construction. To be effective, the incentive amount should exceed the Contractor’s Additional Cost (CAC) for completing the project early. Yet, estimating CAC poses a major challenge to agencies because of contractors’ reluctance to disclose information about their profits. This study introduces a predictive, quantitative model that estimates realistic CACs by combining an existing schedule simulation technique with a regression method. An innovative, reliable tool called Construction Analysis for Pavement Rehabilitation Strategies (CA4PRS) was used for the simulation. Using CA4PRS, a set of contractors’ time-cost tradeoff data was created and a linear regression analysis was performed to predict CAC growth rate by analyzing how the CAC interacts with the agency’s specified schedule goal. The robustness of the proposed model was also validated through two case studies. This model can assist decision-makers in estimating better optimal incentive amounts. 27. Li, Y., Lu, Y., Kwak, Y.H., Le, Y., and He, Q. (2011) “Social Network Analysis and Organizational Control in Complex Projects: A Construction Case of EXPO 2010 China”, Engineering Project Organization Journal, 1(4), 223-237. DOI: 10.1080/21573727.2011.601453. ABSTRACT: Social network analysis (SNA) has been widely used to explore the existence and strength of connections among various actors within an organization. Recently, understanding and interpreting social aspects in project organization have gained great interests in project management research. Consequently, there is a need to analyse complex project organization (CPO) by using SNA with increasing numbers of large-scale and complex projects. The goal of this research is to better appreciate the social network relations in a CPO environment and to improve the organizational efficiency and team performance through new organizational control mechanisms (OCMs). This study first discusses a multi-level social network framework with a focus on the CPO where major analytical components of the framework are presented including modeling elements and structures and preferred parameters. Next, social network-oriented OCM and strategies are illustrated and compared with regular organizational controls. To examine the mentioned SNA framework and strategy, this study employs a construction case of EXPO 2010 Shanghai China and analyses the information transmission, role and positional analysis, clique analysis, management power and leadership of the network. The result of the case study provides insightful suggestions for controlling the complex organization, including enhancement of organizational learning ability, standardized working protocols and regulations, and reinforces the management of key information intermediaries, professional requirement for centrality position units and the power shift in some ‘special units’. The case also reveals that the informal relations have more significant impacts on the organizational power, leadership and control, especially for complex projects. ABSTRACT: This research explores key aspects involved in the process of managing risk associated with projects within the US Department of Defense (DOD). First, various US Government Accountability Office reports are analyzed to identify the strengths and weaknesses of the DOD’s overall program management practices, as well as individual projects. Then, the evolution and progress of United States Army’s Future Combat Systems project is examined in detail as a case study to substantiate the argument that insufficient risk management has contributed to project delays and cost overruns significantly. Poor risk management practices and performance are not unique to the Army, but arises from a system bred into the process of gaining approval to implement projects in the DOD. Incorporating an executable risk management plan in the planning phase and filling key positions with personnel trained to recognize sound proposals from contractors would make significant strides toward improving overall project management practices in the DOD. 24. Kwak, Y.H. and Ingall, L. (2009) “Exploring Monte Carlo Simulations Applications for Project Management” IEEE Engineering Management Review, 37(2), 83-91. DOI: 10.1109/EMR.2009.5235458. Reprint from Risk Management: An International Journal, 9(1), 44-57. ABSTRACT: Applying Value Engineering (VE) in a construction project has proven to be an effective way to save the cost of a project. Different VE models have been developed and used in construction projects in the past. One common attribute of construction projects is the dependence of a highly qualitative decision-making process: capturing, interpreting, and quantifying expert’s subjective judgment. This study proposes an advanced five-phase VE model, each phase of which consists of series of steps to better quantify subjective opinions of VE team members. Construction simulation technique (CYCLONE) is used as a means to minimize the subjectivity in estimating the value of different alternatives in terms of time and cost savings. A case study shows that the advanced five-phase VE model improves analysis, assessment, and decision on value engineering. This new approach has a great potential to minimize subjectivity during VE process and improves VE decision making process by using quantitatively derived data from the simulation analysis. 22. Kwak, Y.H. and Anbari, F.T. (2009) “Analyzing Project Management Research: Perspectives from Top Management Journals” International Journal of Project Management, 27(5), 435-446.DOI:10.1016/j.ijproman.2008.08.004 Selected as Science Direct Top 25 Hottest Articles in International Journal of Project Management. ABSTRACT: The goal of this research was to analyze current and future trends of the allied management disciplines that influence project management. We have collected academicians’ and practitioners’ perceptions on the trends, impact, and challenges relevant to project management. We specifically asked about the availability of knowledge (articles, literature, and experts) and the potential impact of allied disciplines related to project management. We were able to assess where the allied disciplines currently stand in terms of availability and impact as well as make predictions about the future. The thoughts and visions collected from this research provide valuable insights for identifying trends in the allied disciplines and their impact on the future of project management, as well as the opportunities, challenges, and obstacles. We believe that the project management community should be actively engaged in acquiring knowledge and participating in major activities of the allied disciplines to better understand the emerging and promising practices for the future. ABSTRACT: In 2004, Korea became the fifth country in the world to own and operate a high speed railway. There were numerous challenges in planning and managing the high speed railway project that resulted in schedule delays and cost overruns. The delay causes of each activity along the 412 km Korea high speed railway route were difficult to examine because the project consisted of 11,141 activities. First, critical sections in the railway route that influenced significant delays to project completion were selected. Then, delay-cause analyses of those critical sections were conducted in detail. Based on the analysis, five major delay causes for Korea high speed railway were identified. They are: Lack of owner’s abilities and strategies to manage hi-tech oriented mega project; frequent changes of routes triggered by conflicts between public agencies and growing public resistance from environmental concerns; the inappropriate project delivery system; a lack of proper scheduling tool tailored for a linear mega project; and redesign and change orders of main structures and tunnels for high speed railway which is fundamentally different from the traditional railway construction. This paper provides lessons learned for engineers to better prepare and respond to potential causes of schedule delays for mega projects. 19. Kwak, Y.H., Chih, Y., and Ibbs, C.W. (2009) “Towards a Comprehensive Understanding of Public Private Partnerships (PPP) for Infrastructure Development” California Management Review, 51(2), pp.51-78. ABSTRACT: Recently, a significant proportion of major construction companies embarked on the implementation of integrated Information Technology (IT) solutions such as Enterprise Resource Planning (ERP) systems to better integrate various business functions. However, these integrated systems in construction sector present a set of unique challenges, different from those in the manufacturing or other service sector. There have been many cases of failure in implementing ERP systems, so it is critical to identify and understand the factors that largely determine the success or failure of ERP implementation in construction industry. This paper presents the process of developing ERP systems success model to guide successful ERP implementation and to identify success factors for ERP systems implementation. The paper identifies factors affecting the success and failure of ERP systems, and designs a success model to analyze the relationships between key factors and the success of such systems. The proposed ERP systems success model adapts Technology Acceptance Model and DeLone & McLean’s IS Success Model and integrates those with key project management principles. The goal of ERP systems success model is to better evaluate, plan, and implement ERP projects and help senior managers make better decisions when considering ERP systems in their organization. ABSTRACT: Monte Carlo simulation is a useful technique for modeling and analyzing real-world systems and situations. This paper is a conceptual paper that explores the applications of Monte Carlo simulation for managing project risks and uncertainties. The benefits of Monte Carlo simulation are using quantified data, allowing project managers to better justify and communicate their arguments when senior management is pushing for unrealistic project expectations. Proper risk management education, training and advancements in computing technology and Monte Carlo simulation software allow project managers to implement the method easily. In the field of project management, Monte Carlosimulation can quantify the effects of risk and uncertainty in project schedules and budgets, giving the project manager a statistical indicator of project performance such as target project completion date and budget. 11. Watson, R. and Kwak, Y.H. (2005) “Development of a Parametric Estimating Model for Technology-Driven Deployment Project” ICFAI Journal of Operations Management, August, 2005. Reprint of Watson, R. and Kwak, Y.H. (2004) “Development of a Parametric Estimating Model for Technology-Driven Deployment Project” 2004 Winter Simulation Conference, Washington, DC, December 5-8, 2004. ABSTRACT: Risk tolerance is often misunderstood or overlooked by project managers. The levels and perspectives of risk tolerance are dynamic throughout the project lifecycle. Risk tolerance has three different perspectives when you are involved in a project. The firm’s risk tolerance varies according to the firm’s financial stability and project diversification. A project manager’s risk tolerance is affected by job security and corporate culture. The stakeholder’s risk tolerance is influenced by project objective. Unfortunately, failures in communication between the stakeholder and project manager are quite common because there are few applicable tools available to support the process. The project success will depend on agreeable level of risk tolerance and support of compensation policies, corporate culture, performance reviews, and early risk management planning. 12. Kwak, Y.H. and Keleher, J.B. (2015). 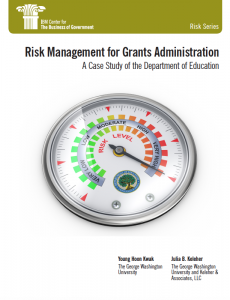 “Risk Management for Grant Administration: A Case Study of the Department of Education” IBM Center for the Business of Government. 45 pages. 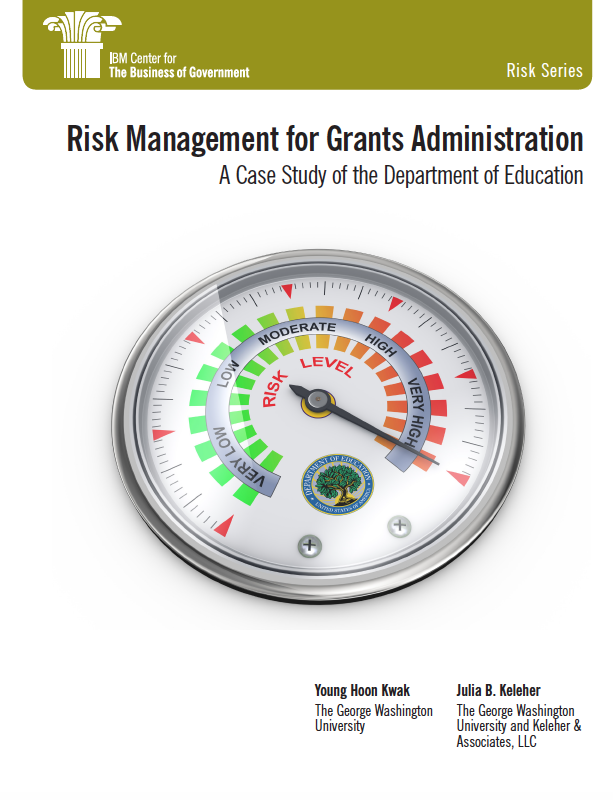 ABSTRACT: On behalf of the IBM Center for The Business of Government, we are pleased to present this report, Risk Management for Grants Administration: A Case Study of the Department of Education, by Young Hoon Kwak and Julia B.Keleher, George Washington University. In this report, Kwak and Keleher examine the experience of the U.S. Department of Education in implementing risk management initiatives, which it initiated in 2001.During this period, the department created its Risk Management Service, and expanded that office in 2007.At the same time, the department also con­tinued to refine and revise its risk management tools, and now uses two new tools: the State Score Cards and the Entity Risk Review. This report explains how these two tools are being used and provides examples of how risk management tools have been used to track the progress of two high risk grantees: Detroit Public Schools and Puerto Rico. Based on their examination of the Department of Education’s experience, Young and Keleher present a series of lessons learned and recommendations for other agencies. A major lesson is that the use of an automated, data-driven risk assessment tool enabled the department to apply uniform and consistent risk assessment procedures and make better use of audit data. The authors also learned that effective risk management is an iterative process that requires thoughtful use of existing data sources and consistent efforts to incorporate new ones. We hope that government leaders who are interested in imple­menting risk management initiatives will find the Department of Education’s experience helpful and instructive as they strive to improve the management and oversight of federal funds. 11, Kwak, Y.H. Liu, M., Patanakul, P., and Zwikael, O. (2014). 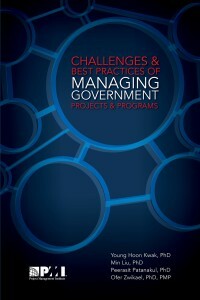 Challenges and Best Practices of Managing Government Projects and Programs. 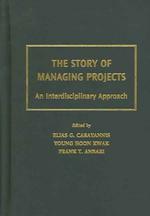 PMI Publications, ISBN: 9781628250657, 88 pages. ABSTRACT: Many government projects and programs are prolonged for years, failing to meet the projects’ objectives, wasting taxpayers’ money, or they are abruptly terminated in the midst of planning or implementation. Government funded projects and programs set out to achieve national growth and enhance the lives of citizens. They are ubiquitous—and notoriously unwieldy. Drawing on an impressive array of large-scale government projects gleaned from government audit reports across three major sectors—infrastructure and transportation, information systems, and defense—this study explains why government projects go wrong and what can be done to improve their success rates. Government projects undertaken in the United States, the UK, and Australia are examined in relation to non-financial benefits, political dynamics, formal project management processes, megaproject approaches, long product life cycles, and engagement with multiple stakeholders. With these characteristics as a framework, readers gain an understanding of the unique characteristics and recurring problems of managing government projects and programs. This book offers useful recommendations for disentangling the overlapping technological, legal, political, and social factors affecting these kinds of projects, including: • Addressing current and future needs of product durability, functionality, and flexibility • Considering public-private partnerships (PPP) • Splitting programs into smaller, more manageable projects • Consulting the business community. 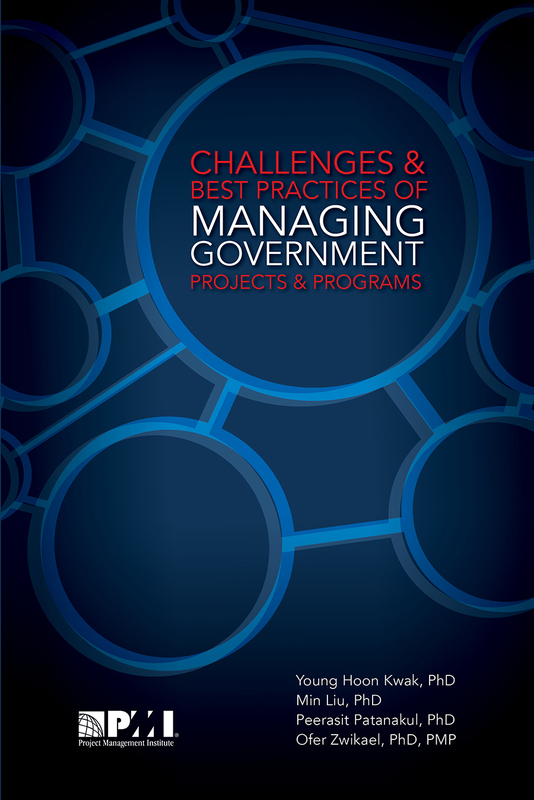 Challenges and Best Practices of Managing Government Projects and Programs provides a crucial foundation for practitioners, researchers, policymakers, as well as constituents to realize the benefits governments can bring to their people. 10. Lee, G. and Kwak, Y.H. (2011). 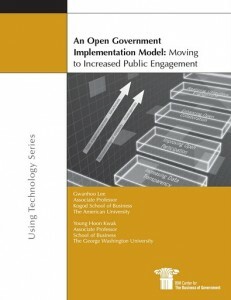 “An Open Government Implementation Model: Moving to Increased Public Engagement” IBM Center for the Business of Government. 35 pages. ABSTRACT: On behalf of the IBM Center for The Business of Government, we are pleased to present this report, An Open Government Implementation Model: Moving to Increased Public Engagement, by Gwanhoo Lee, The American University, and Young Hoon Kwak, The George Washington University. The release of this report comes on the heels of the first anniversary of the Open Government Directive issued in December 2009. This Directive required all executive departments and agencies to take the following steps toward the goal of creating a more open government: • Publish government information online • Improve the quality of government information • Create and institutionalize a culture of open government • Create an enabling policy framework for open government. Professors Lee and Kwak present a road map — the Open Government Implementation Model — that agencies can follow in moving toward accomplishing the objectives of the Directive. The model set forth by Professors Lee and Kwak recommends that agencies should advance their open government initiatives in stages, moving from one stage to another as they mature their adoption of open government. To illustrate their path toward implementing the goals of the Directive, Professors Lee and Kwak examine five cases of open government initiatives within the Department of Health and Human Services (HHS), including initiatives by the Centers for Medicare and Medicaid Services and the Food and Drug Administration. The case studies illustrate how federal agencies are making progress in moving to a more open and transparent government. The model can clearly be adapted by other agencies. We trust that this report, as well as previous IBM Center reports on social media and citizen engagement, will serve as useful and informative guides to government agencies as each responds to the challenges set forth in the Open Government Directive. This report presents an Open Government Implementation Model (OGIM) for guiding government agencies towards open government. Our model defines four implementation stages and describes the focuses, deliverables, benefits, challenges, best practices, and metrics for each stage. A key tenet of the Implementation Model is that government agencies should advance their open government initiatives incrementally, focusing on one implementation stage at a time. Starting from increasing data transparency (Stage One), the process moves on to improving open participation (Stage Two), enhancing open collaboration (Stage Three), and realizing ubiquitous engagement (Stage Four). We argue that by following this sequence, agencies can minimize risk and effectively harness the power of social media in order to engage the public. 9. Kwak, Y.H. and Anbari, F.T. (2010). 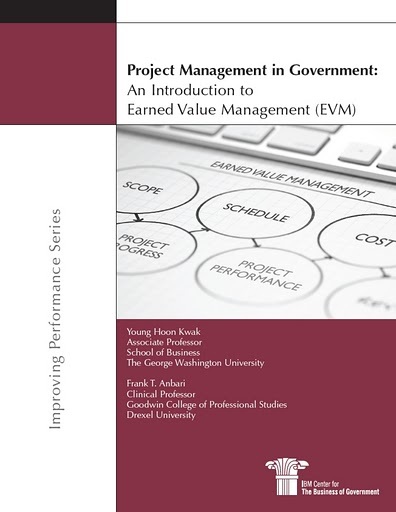 “Project Management in Government: An Introduction to Earned Value Management” IBM Center for the Business of Government. 43 pages. ABSTRACT: On behalf of the IBM Center for The Business of Government, we are pleased to present this report, “Project Management in Government: An Introduction to Earned Value Management (EVM),” by Young Hoon Kwak, The George Washington University, and Frank T. Anbari, Drexel University. Management of government projects, programs, and portfolios—and the related expenditures of public funds—are major, visible areas of interest and concern. Emphasis on performance improvement in government continues to increase steadily, supported by mandates imposed by government laws and public pressure. Despite a growing understanding of the determinants of success, increasing maturity, and a stream of successful programs and projects, project failures continue at an alarming rate. Earned Value Management (EVM) is a powerful methodology that gives the executive, program manager, project manager, and other stakeholders the ability to visualize a project’s status at various points during the project life cycle and consequently manage projects, programs, and portfolios more effectively. EVM helps provide objective project assessments when applied appropriately, and clearly quantifies the opportunities to maintain control over cost, schedule, and specifications of various types of projects. EVM helps managers in making evidence-based decisions about project scope, resources, and risks; hence, it allows effective control and project oversight. The National Aeronautics and Space Administration (NASA) has been one of the pioneers in the U.S. government in using project management principles, tools, and techniques, and consistently demonstrates the effective application of EVM to the oversight and management of its many projects and programs. This report describes how NASA applies EVM principles to accomplish agency objectives, strategies, and missions. By using EVM, NASA also complies with relevant federal government regulations that require continuous monitoring and control of projects and programs. We trust that this report will be helpful to federal government agencies, other public organizations, government contractors, and private sector organizations in adapting EVM principles to enhance the management and success of their projects, programs, and portfolios. 7. Kwak, Y.H. (2007). “Evaluating Project Management Effectiveness of Boston Big Dig and Three Gorges Dam in China” Chapter 14 in Project Manager's Handbook: Applying Best Practices Across Global Industries, Cleland, D.I. and Ireland, L.R. (editors), McGraw-Hill. ISBN: 0071484426, Sep.
2. Ibbs, C.W., Reginato, J. and Kwak, Y.H. (2004). "Developing Project Management Capability – Benchmarking, Maturity, Modeling, Gap Analyses, ROI Studies". Chapter 48 in The Wiley Guide to Managing Projects. Peter W. G. Morris (Editor), Jeffrey K. Pinto (Editor) John Wiley ISBN: 0-471-23302-1. 1440 pages. September 2004. ABSTRACT: How good are your organization’s Project Management (PM) practices? How well do your practices compare with those of your peers in the business world? Are you making the appropriate investments in new PM systems, processes, and practices? These are the questions that few firms can answer directly and accurately. Yet their answers can unlock the gate to superior business performance. The first step in understanding an organization’s PM effectiveness is to determine its Project Management Maturity (PMM). By having a grasp of where a company lies on the PMM spectrum, management can determine its PM strengths and weaknesses, which is enormous value in today’s highly competitive, project-oriented marketplace. Stated simply, a company’s PMM is a measure of its current PM sophistication and capability. Knowledge about the most sophisticated PM tools does not necessarily mean that those complicated tools will be used on every project. Rather, appropriate knowledge means that the firm and its managers understand which PM tool is appropriate for the demands of the project. PMM helps gauge such management wisdom. Once PMM is known, it can be used to both understand the company’s current standing and to develop a roadmap for future improvements in PM processes and practices. Once on the path to such PM enlightenment, companies can craft their PM capabilities and strategy to enhance competitive advantage and wealth creation. The purpose of this chapter is to describe how PMM benchmarking can help organizations develop that roadmap. We will do this by first highlighting the importance of PMM in today’s competitive marketplace. Secondly, we will exhibit techniques for determining current levels of PMM and defining a course for PMM improvement. Lastly, we will demonstrate methods to enumerate the value of PM improvement to ensure that investments in PM are reaping the desired returns. 1.Ibbs, C.W. and Kwak, Y.H., The Benefits of Project Management- Financial and Organizational Rewards to Corporations, PMI Publications, Sept. 1997, ISBN: 1-880410-32-X. 90 pages. 49. Choi, J.O., Kwak, Y.H., Shane, J., and Shrestha, B.K. (2019) "Identifying Innovative Technologies and Management Approaches for UMM Industries", The 2019 ASCE International Conference on Computing in Civil Engineering, Atlanta, GA, June 17-19, 2019. ABSTRACT: In 2017, the Construction Industry Institute (CII)’s Upstream, Midstream, and Mining Commodity Market (UMMC) Research Team (RT) was established to explore design standardization through collaborative research. The RT’s essential research question is: “How can higher levels of facility design standardization be achieved in the UMM sector?” To tackle this research question, the RT identified 38 innovative technologies and management approaches from various sectors and organized them. Based on various innovation practices and theories, the RT generated unique standardization applications for the UMMC sector and assessed the impact and likelihood of their applications on the UMM sector. The results show that innovative technologies and approaches such as Modularization, Mobile User Interface Devices, Wireless Networks for Construction Sites (WLAN), Stakeholder Engagement and Alignment, and Automated Design are very likely to occur within 5 years and impact overall design standardization success which will help practitioners achieve higher levels of design standardization that lead to greater predictability, increased agility, and increased cost-effectiveness of capital projects. The managerial implications of adopting innovative technologies and approaches are also discussed. 48. Choi, J.O., O'Connor, J., Kwak, Y.H. (2019) "Calibrating CII RT283’s Modularization Critical Success Factor Accomplishments" 2019 Modular and Offsite Construction, Banff, AB, Canada, May 21-24, 2019. ABSTRACT: Modularization is a well-known construction technique where sections of the job are moved from on-site to a fabrication shop. Previously, the researchers identified the 21 most influential Critical Success Factors (CSFs) for successful modularization and quantified the frequency of each CSF’s accomplishment by conducting a survey with 19 subject matter experts, and a case study with three modular projects. Through this methodology, the findings relied on the experience of experts. However, still missing from the understanding of modularization CSFs is a validation of the current frequency of each CSF’s accomplishment by examining actual modular projects using a sufficient number of samples. This paper presents a comparison of CSF accomplishment frequency between 25 actual sample projects (project based) and the industry experts’ survey results (experience-based estimation). The study results indicate that the industry experts made a good estimation of the current occurrence frequency of each CSF. The study did identify, however, three significantly overestimated CSFs and three underestimated CSFs. The three most overestimated CSFs are Owner-Furnished/Long Lead Equipment Specification, Cost Savings Recognition, and O&M Provisions. The three most underestimated CSFs are Contractor Experience, Management of Execution Risks, and Transport Delay Avoidance. This study will help the industry to 1) better understand modularization CSFs and their accomplishment statuses; 2) achieve higher modular project performance by accomplishing the CSFs. 47. Choi, J.O., Shane, J.S., Kwak, Y.H., and Shrestha, B.K. (2018) “How can higher levels of facility design standardization be achieved in the Upstream, Midstream, and Mining Commodity sector?” 2018 Construction Research Congress, New Orleans, LA, April 2-4, 2018. ABSTRACT: Previous research by the Construction Industry Institute (CII) has recognized that the shipbuilding industry has accomplished high levels of both design standardization and modularization, reaping substantial benefits. In addition, to maximize modularization benefits on capital projects, the levels of design standardization also must be increased substantially. However, the levels of standardized facility design in the Upstream, Midstream, and Mining Commodity (UMMC) market fall short of the desired criteria. As the market understands and recognizes its value more fully, the level of design standardization will increase. The CII UMMC standardization research team was established in 2017 to address this situation. In framing their purpose, the team posed this question: How can higher levels of facility design standardization be achieved in the UMMC sector? To answer this research question, first, there was a need to better understand barriers and challenges of achieving higher levels of facility design standardization in the UMMC market. Thus, this paper focuses on identifying these barriers and challenges by conducting an extensive literature review and subject matter expert interviews. The authors have concluded from this study that the key barriers and challenges rest with Owners; Standard & Specs; Engineers; Mindset/Culture of Customization; Quality Vendor Availability and as such. These have been further explained in later sections of this paper. Facility owner/operators, contractors, and fabricators will be the beneficiaries of this research, especially those from the UMMC Market. 46. Kettunen, J. and Kwak, Y.H. (2017) “Scheduling Public Request for Proposals”, 2017 Industry Studies Conference, Washington, DC, May 24-16, 2017. 45. Keleher, J. and Kwak, Y.H. (2016) “Managing Risk and Implementing Strategy: The Importance of Leadership and Management Skills”, 2016 PMI Global Congress, San Diego, CA, Sept. 25-27, 2016. ABSTRACT: This paper explores how project management methodology was critical to the success of an innovative risk management initiative at the U.S. Department of Education (ED). The paper explores a 2013 project deployment of an enterprise-wide business analytics tool that identifies and assesses grantee risk. It provides an interesting example of how project management can support strategy implementation and also illustrates how project leadership, technical project management expertise, and strategic management skills were central to the successful planning and execution of this project. ABSTRACT: The entire construction safety and productivity are greatly impacted by temporary structures. Despite the impacts, temporary structures are used in construction projects without sufficient planning efforts. As a result, there are widespread safety, productivity, constructability, and site coordination problems caused by temporary structures. Focusing on scaffolding, this research optimizes temporary structure plans using building information modeling (BIM). An optimization engine and a safety simulation engine were developed. The optimization engine generates multiple alternative scaffolding plans. The safety simulation engine simulates daily construction site conditions and automatically identifies potential safety hazards related to scaffolding. In a case study using a real world construction project, the optimization engine generated alternative scaffolding plans and the simulation engine successfully detected potential safety hazards. The construction and safety managers of a case study project could identify multiple scaffolding plans that were better than the original plan in terms of safety, cost, and duration. The overall results demonstrate that the proposed approach can assist in the creation of safer and more productive plans for scaffolding at a pre-construction stage. 43. Choi, S., Han, S.H., and Kwak, Y.H. (2015) “How do Project-Based Organizations adapt to the Changing Global Environment?” International Research Network on Organizing by Projects (IRNOP) conference, London, UK, June 22-24, 2015. ABSTRACT: The aim of this research is to better understand how project based organizations sustained their competitive advantage when faced with unfavorable and changing market circumstances. With this goal in mind, this study constructs a theoretical foundation from which to examine international general contractor’s competitive advantage, giving consideration to the market environment, firm resources, and firm capabilities. Furthermore, it aims to present various research theories on strategic management that have not been widely considered in the field of engineering-construction-infrastructure sector, as well as to compare those theories with new findings. Case study is conducted to help look into the strategy and competitive advantage of actual engineering-construction organizations within their real-life context. 42. Kwak, Y.H. (2014) “Managing Government Projects and Programs: Lessons Learned” PMI Global Congress 2014-North America, Phoenix, AZ, Oct. 26-28, 2014. 41. Kwak, Y.H., Patanakul, P, Liu, M., and Zwikael, O. (2014) “Lessons Learned from Investigating Large Government Projects and Programs” 2014 PMI Research and Education Conference, Portland, Oregon, July 27-29, 2014. ABSTRACT: The objective of this symposium is to discuss the recently completed PMI research project on investigating large government projects and programs. We will present the unique challenges of government projects and program and provide a series of recommendations to improve governmental project management practices. We first discuss six key characteristics of government projects that are: (1) Pursuing non-financial benefits; (2) Susceptible to political environment and dynamics; (3) Following mandated project management process, (4) Being a large and complex mega projects, (5) Having a long product lifecycle, and (6) Dealing with multiple stakeholders. Based on six key characteristics of government projects and programs, we are providing series of recommendations to assist and improve project management performance. The findings and discussions of this study will help policy makers, government officials, project managers, and the general public to understand the importance of adopting project management principles, tools, and techniques for governmental projects and programs that would enhance project efficiency and benefit realization. The symposium will also help practitioners make better decisions when they involve in large-scale, complex government projects and programs. 40. Sadatsafavai, H., Walewski, J., Williams, N.L., and Kwak, Y.H. (2014) “Evolution of Project Based Organization: A Case Study” 4th Conference of the International Network of Business and Management, Barcelona, Spain, June 25-27, 2014. ABSTRACT: This paper examines the development and implementation of Project Based Organization (PBO) over a period of 30 years. Overall, the PBO’s evolution broadly followed the prevailing approaches in improving organization management practices. PBO’s capability to adopt and implement project management frameworks improved over time as senior managers became more masterful at matching project management actions into the organizational context. This research also presents a systematic approach of adopting project management maturity models for identifying and implementing project management practices and processes to increase the effectiveness and comprehensiveness of overall management practices. The study concludes with a series of recommendations in further improving project management practices and processes in PBOs. 39. Ghosh, S., Amaya, L., and Kwak, Y.H. (2014) “Knowledge Governance Model for Successful Projects” 23rd International Management of Technology Annual Conference, Washington, DC, May 22-26, 2014. 38. Park, C. and Kwak, Y.H. (2014) “Project Ecosystem Competency Model” 23rd International Management of Technology Annual Conference, Washington, DC, May 22-26, 2014. ABSTRACT: This study proposes a conceptual framework of Project Ecosystem Competency Model that could contribute to the creation of sustainable performance in engineering organizations and industries as well as enhancing the value of project stakeholders to contribute to project sustainability. Within the engineering organizations, working processes are evolving from operational-oriented processes, which are repetitive and sustainable, to project-oriented processes, which can be defined as temporary and unique. In addition, organizational structures are changing from functional structures to project-driven structures. For example, engineering projects are becoming influential to industrial and organizational sustainability because of its performance of special features and requirements of the projects. However, engineering projects are not easily sustainable because they are only evaluated by one criterion whether the project has succeeded or failed. For many organizations or industries, more than one project is being executed simultaneously, and these multi-project environments can affect the sustainability of the organizations or industries. This study proposes a Project Ecosystem Competency Model to show how ecosystem impacts project lifecycle and understand mutual and reciprocal relationship for successful management of multiple projects. Project Ecosystem Competency Model consists of three aspects: design and maturity of the project ecosystem; project success factors and performance index; and the competency of engineering project management organization that contributes to the maturity of the project ecosystem. 37. Choi, K., Ryoo, B.Y., and Kwak, Y.H. (2013). “Cluster-Driven Life-Cycle Cost Analysis Model for Transportation Infrastructure Improvement Projects.” UKC 2013, East Rutherford, NJ, August 7-11. SUMMARY: The main objectives of this study are to create, test, and validate a novel decision-support framework that determines the most realistic, reliable future maintenance costs. The model was built based on the data collected from the Pavement Information Management System. 36. Gosh S., Kwak Y.H., and Cheerla A. (2013) “Dimensions and Codes of Good Project Governance” 11th International Research Network on Organizing by Projects (IRNOP) conference, Oslo, Norway, June 17-19, 2013. ABSTRACT: The rise of attention to projects as primary vehicle to execute corporate strategic objectives has questioned if projects can steer itself in a difficult situation, which can be done if proper project governance is in place. Despite the large body of literature in project governance and recent up rise in interests in project governance, there is no comprehensive study to understand what is ‘good project governance’? Borrowing ideas from social science, the article examine codes of good project governance. A set of code of good project governance was developed as a set of based on a case study which was conducted to examine the concept of good project governance and identify list of observations related to project governance. This paper aims to be inclusive rather than exclusive, to encourage discussions of all the dimensions of good project governance. 35. Ahn, Y.H. Kwak, Y.H. and, Suk, S.J. (2013) “Organizational Transformation Strategies for Adopting Building Information Modeling in the Engineering-Construction Industry” The 5th International Conference on Construction Engineering and Project Management, Anaheim, CA, Jan 9-11, 2013. 34. Suh, M.J. Pearce, A.R., and Kwak, Y.H. (2013) “The Effect of LEED Certified Building on The Surrounding Neighborhood in New York City” The 5th International Conference on Construction Engineering and Project Management, Anaheim,CA, Jan 9-11, 2013. 33. Kwak, Y.H. (2012) “Lessons Learned from the History of Hoover Dam Project” US-Korea Conference on Science, Technology, and Entrepreneurship (UKC 2012), Los Angeles, CA, Aug 8-11, 2012. 32. Kwak, Y.H., Liu, M., Patanakul, P., and Zwikael, O. (2012) “Strategic Management of High-Risk Government Mega Projects and Programs” PMI Research and Education Conference, Limerick, Ireland, July 15-18, 2012. ABSTRACT: The application and performance of project, program, and portfolio management in government is historically poor as reported by United States Government Accountability Office, United Kingdom’s National Audit Office, Australian National Audit Office, and others. The goal of this research is to propose a strategic roadmap for successful implementation of project, program, and portfolio management in government. This presentation will analyze the performance of past and on-going high-risk government projects by identifying factors of success/failure of government projects and programs from a global perspective. The panel will also identify common reasons for poor project performance in high-risk government, analyze relationships between the performance of government projects and programs and their characteristics (e.g. budget size, duration, scope, and team composition), and report key lessons learned and provide recommendations to improve the project management performance in high-risk government programs. The panelists are particularly interested in mega projects as many of the government initiated or government-funded projects are large, complex, and high-risk. Three major sectors in the government have been identified to evaluate and analyze project management practices and performance: Transportation/infrastructure; defense/space; and information systems development and deployment. 31. Lee, G. and Kwak, Y.H. (2011) “A Maturity Model for Technology-Enabled Open Government”, Pre-ICIS eGovernment Workshop, Shanghai, China, December 4, 2011. 30. Ghosh, S., Boswell, J., Kwak, Y.H., and Skibniewski, M. (2011) “Risk Governance Framework for Enterprise Wide Application Implementations”, IEEE International Technology Management Conference (ITMC)-2011, San Jose, CA, June 27-30. 29. Ghosh, S., Negahban, S., Kwak, Y.H., and Skibniewski, M. (2011) “Impact of Sustainability on Integration and Interoperability between BIM and ERP- A Governance Framework”, IEEE International Technology Management Conference (ITMC)-2011, San Jose, CA, June 27-30. 28. Lee, G. and Kwak, Y.H. (2011) “Open Government Implementation Model: A Stage Model for Achieving Increased Public Engagement” 12th Annual International Conference on Digital Government Research (dg.o 2011): Digital Government Innovation in Challenging Times, College Park MD, June 12–15 2011. 27. Young, L., Valerdi, R., Farr, J., and Kwak, Y.H. (2011) “An Approach to Estimate the Life Cycle Cost and Effort of Project Management for Systems Centric Projects”, 2011 International Society of Parametric Analysts (ISPA) and the Society of Cost Estimating and Analysis (SCEA) Conference, Albuquerque, NM, June 7-10, 2011. ABSTRACT: One of the key challenges in predicting life cycle costs (LCCs) is to develop an accurate top down method that can be used in the early phase of a system’s life cycle to estimate hardware, software, integration, and management costs. Models have been developed for systems engineering (SE) costing components of management, but the literature is void of project management (PM) costing methodologies. The lack of costing capability can cause project cost estimates to be unreliable and escalate to actual cost overrun, and ultimately lead to unfavorable financial performance and project outcome. Thus, the research study proposes a framework for evaluating PM costs required for the conceptualization, design, test, and deployment of large-scale systems centric projects. The ultimate goal of the research study is to construct a cost estimating model that can accurately and consistently predict the appropriate and adequate amount of PM effort for systems centric projects. The proposed framework consists of two PM cost models which are investigated by this research effort via a series of surveys and interviews with industry PM practitioners and subject matter experts. The first proposed PM model is a synthesis of the Constructive Systems Engineering Cost Model (COSYSMO) framework with variations on the effort multipliers that are primarily driven by PM functions and characteristics commonly seen throughout aerospace and defense systems projects. The primary goal of the first proposed model is to determine the cost relationship between SE project size and PM effort, and whether PM cost and effort is proportional to SE cost and effort for aerospace and defense projects. The second proposed model is developed based on the PM processes, activities, attributes and characteristics that are universally shared and practiced by PM practitioners across various projects and industries. The focus of the second proposed model is to determine and construct a cost relationship based on project factors that dictate PM functions and characteristics, which are multiplicatively impacted by PM efficiency. This PM functions-driven model estimates the PM cost and effort required for systems development projects, regardless of its industry origin, to support PM practitioners and cost estimators across different domains. The study is expected to provide several benefits that help project sponsors and cost estimators measure and quantify PM effort, ultimately generating reliable PM cost estimates. Project sponsors and cost estimators who utilize the proposed cost estimating models can expect their projects to receive specific benefits, which include: 1. Determine adequate amount of resources needed for PM effort, 2. Produce reliable and defensible cost estimates for PM effort, 3. Allocate appropriate amount of PM resources for specific PM functions, and 4. Allow more robust and accurate project planning and tracking of cost and resources. Moreover, once both 2 proposed models are validated and verified by industry experts and data, the research study can further measure and compare the accuracy and consistency given in each model to determine the applicability and appropriateness of each model for specific industry usage and calibration. 26. Choi, K., Lee, E.B., Kwak, Y.H., and Pyeon, J.H. (2011). “Optimal Incentive/Disincentive Predictive Model for Transportation Projects” 2nd International Conference on Transportation Construction Management, Federal HighwayAdministration, Orlando, FL, Feb. 7-10, 2011. ABSTRACT: Over the years, tools and methods for determining Incentives/Disincentives (I/D) amounts have advanced, but these tools still have crucial limitations insofar as they cannot concurrently account for project-specific peculiarities, Contractor’s Additional Cost (CAC), total savings to road users and to the agency, and reasonable adjustments of total savings. The objective of this study is to develop a predictive decision-support model that determines the realistic I/D amounts by combining an existing scheduling simulation with a statistical method. First, schedule and traffic simulations using Construction Analysis for Pavement Rehabilitation Strategies (CA4PRS) was conducted to create contractor’s time-cost tradeoff data and to build road user cost lookup tables. Then, a linear regression analysis was performed to predict CAC growth rate by analyzing how the CAC interacts with the agency’s specific schedule goal. The model employs an integrated analysis to capture project schedule, CAC, and total savings concurrently and to determine the optimal incentive that exceeds the CAC growth (lower bound) for cutting down construction times and be less than a portion of the decrease in total time value savings to road users and to the agency (upper bound). Two case studies were presented to validate the robustness of the proposed model. Applying a model that predicts an appropriate I/D amount will result in significant monetary savings to the agencies and better use of public funds for future infrastructure projects. 25. Choi, K. Kwak, Y.H., and Yu, B. (2010) “Quantitative Model for Determining Incentive/Disincentive Amounts through Schedule Simulations”, 2010 Winter Simulation Conference, Baltimore, MD, Dec. 5-8, 2010. ABSTRACT: One groundbreaking way of expediting any construction is to offer contractors a monetary incentive. To be effective, the incentive amount should be larger than the contractor’s additional cost (CAC) for expediting construction time. Yet, estimating the CAC poses a major challenge because contractors are reluctant to disclose their profit information. This study introduces a quantitative model that estimates realistic CACs through schedule simulations on four different resource usage levels. An innovative and reliable tool called Construction Analysis for Pavement Rehabilitation Strategies (CA4PRS) was used for the simulation. Using CA4PRS, a set of contractors’ time-cost tradeoff data was created and a linear regression analysis was performed to predict the CAC growth rate and to analyze how this interacts with the agency’s specified schedule goal. The robustness of the proposed model was also validated through a case study. This model can assist decision-makers to make better decisions when estimating optimal incentive amounts. 24. Young, L., Farr, J., Valerdi, R., and Kwak, Y.H. (2010) “A Framework for Evaluating Life Cycle Project Management Costs on Systems Centric Projects”, American Society for Engineering Management 2010, 31st Annual Conference, Rogers, AR., October 13-16, 2010. ABSTRACT: One of the key challenges in predicting life cycle costs (LCCs) is to develop an accurate top down method that can be used in the early phase of system’s life cycle to estimate hardware, software, integration, and management costs. Models have been developed for systems engineering (SE) costing component of management, but the literature is void of project management (PM) costing methodologies. Thus, we propose a framework for evaluating PM costs required for the conceptualization, design, test, and deployment of large-scale systems centric projects. The elements of management in classes of PM and SE were identified. We determined potential PM cost-drivers by reviewing standard work breakdown structure (WBS) elements, hardware and software development, and integration tasks. We then correlated several PM cost indicators to factors that have effects on SE cost adjustment factors. This paper addresses a qualitative model and hopes to lay the foundation for a quantitative methodology in the future. 23. Kwak, Y.H. (2010) “Project Portfolio Management (PPM) - Strategic and Operational Agility through Projects” Project Management Institute Research Conference, Washington, DC, July 11-14, 2010. 22. Anbari F.T. and Kwak, Y.H. (2009) “Trends of Project Management Research” 2009 Annual Meeting of the Academy of Management, Chicago, Aug 7-11, 2009. 21. Kwak, Y.H. and Anbari, F.T. (2008) “Project Management Research Trends of Allied Disciplines” 2008 PMI Research Conference, Warsaw, Poland, July 13-16, 2008. ABSTRACT: This study looks at project management from the perspective of its relationship to allied disciplines in the management field. By exploring, identifying, and classifying management journal articles of PM allied disciplines, the evolution and trends of PM research are revealed. This study specifically investigates the research in allied disciplines from the management academy’s viewpoint, instead of looking at project management research trends from the project management community’s perspective. The goal of this research is to better understand project management from the management world and argues that project management is a legitimate academic discipline by reviewing research trends of its allied disciplines. To thoroughly investigate project management research in allied disciplines, it is necessary to review major journal publications in the management and business field. Since the management and business field is very broad, this research identified and defined eight different categories of allied disciplines in project management. Then, we have selected 18 top business and management academic journals that published articles related to project management to review and categorize journal articles into these eight different areas. By chronologically analyzing and categorizing more than 500 journal articles from the 18 journals in the business field published from 1950s to summer of 2007, this study analyzes publications trends of different domains (Operations Research vs. Organizational Behavior vs. Practice) and different journals and predict the future of project management as an academic discipline in the mainstream management research. 20. Kwak, Y.H., Wetter, J., and Anbari, F.T. (2006) “Business Process Best Practices: Project Management or Six Sigma?” 2006 PMI Research Conference, Montreal, Canada, July 16-19, 2006. 19. Ryoo, B.Y., Skibniewski, M.J., and Kwak, Y.H. (2006) “E-Business Solutions in the Construction Industry in Korea: National Construction IT Plans and their Implementation in the Public Construction Sector” 2006 Information Resource Management Association, 17th Annual IRMA International Conference, Washington, DC, May 21-24, 2006. 18. Anbari, F.T. and Kwak, Y.H. (2005) “Six Sigma, Programs and Proactive Risk Management” Project Management Challenge 2005, Second Annual NASA Project Management Conference, College Park, MD, March 22-23, 2005. ABSTRACT: In the design and implementation of its strategy, an organization needs to integrate two major goals to enhance its effectiveness, efficiency, and adaptability: 1) Improvement of its current products, services, and processes. This goal can be pursued through Six Sigma and quality initiatives, and 2) Planning and introduction of new products, services, processes, and technologies. This goal can be carried out as coordinated projects and programs. Successful implementation and growing organizational interest in the Six Sigma method have been exploding in recent years. It is rapidly becoming a major force driving the strategy of numerous successful organizations. Application of the Six Sigma method can reduce project execution risks and enhance the effectiveness of organizational risk management. Involvement in Six Sigma projects is becoming an important career path requirement in many organizations. Understanding the main concepts of the Six Sigma method provides project and program professionals important opportunities in Six Sigma leadership, and proactive program risk management. It allows them to better support their organizations’ project coaching, mentoring, and training needs. 17. Watson, R. and Kwak, Y.H. (2005) “Conceptual Estimating of Deployment Costs for Technology-Driven Projects” Project Estimation Conference (Internal), IBM Academy of Technology, Boulder, Co, Jan 24-26, 2005. ABSTRACT: The purpose of this paper is to investigate and discuss the potential barriers of SDI implementation projects of various cities in developing countries and identify the key lessons learned from those projects. Different projects are reviewed in terms of resources, institutional organization, and data standards and information access. The projects are selected from cities developing countries in South Asia, Middle East, Europe, Latin America, North America andAfrica. Many cities have plans to implement SDI projects in the coming future. By examining the strengths and weaknesses of various SDI projects in developing countries, project managers and city officials who are planning and implementing the SDI projects will be able to better understand and establish urban policy for public infrastructure administration. Improved quality of infrastructure management by successful implementation of SDI projects will enhance urban economic activity and improve administration. Also, efficient documentation and monitoring of infrastructure information will greatly assist fiscally stressed local governments, where property taxes are the main source of local government revenues in developing countries. ABSTRACT: The purpose of this research is to investigate the Spatial Database Infrastructure (SDI) implementation projects of various cities in developing countries and identify the key lessons learned from those projects. Different projects are reviewed in terms of resources, institutional organization, data standards, and information access. By examining the obstacles and opportunities of various SDI projects in developing countries, project managers and city officials will be able to better understand and establish, plan, and implement urban SDI systems in the future. External funds or technical assistances can help the SDI implementation, only when they are supported by decision makers’ strong commitment and continued internal supports. Some cities found that the collaboration between academic institutions and local governments is an effective way to build and train human resources where there is scarce infrastructure in training. In general, weak political, financial, and administrative supports were obstacles to project success when implementing SDI. Finally, clear and concrete data standards are the requirements to share spatial information between institutions and public. ABSTRACT: Project Risk Management practices, tools, and techniques have emerged as one of the hottest topics in the project management field. However, risk management practice has not been fully matured or implemented in various organizations, therefore there is a need to assess where the current practice stands and try to identify room for improvement in implementing project risk management. As a course coordinator of project risk management at project management program at the George Washington University, the presenter has been actively facilitating discussions related to project risk management. This presentation will report the perceptions and practices of project risk management by collecting more than 300 years of project managers’ experiences. ABSTRACT: The traditional method of contracting for the construction of a residential or commercial development, infrastructure, schools, and government facilities has been the “low bid” approach. There are other project delivery methods which have been successfully utilized in the State of Florida. Design/Build is the most widely understood alternative project delivery method and is currently successfully employed in many construction projects throughout Floridaand the world. A need to mix the best of both of these project delivery methods and provide greater owner interaction in the design and construction process lead to the development of the Construction Management at Risk (CM@Risk) project delivery method. The purpose of this paper is to familiarize the audience with the CM at Risk process. First it compares its benefits with the traditional and design/build approaches. Then, the paper explores the benefits of the CM@Risk project delivery method for the construction of Stormwater Treatment Area 3/4 (STA 3/4), the largest of the STAs in the Everglades Construction Project. ABSTRACT: This study, sponsored by the Project Management Institute (PMI), examines current PM levels and practices in various companies and industries. First, this research develops a five level PM Process Maturity Model to better understand levels of PM sophistication. Second, a PM process maturity benchmarking methodology is developed and presented to measure an organization’s current PM level quantitatively. This paper summarizes the initial results of PM process maturity benchmarking. It also analyzes the quantitative relations between an organization's PM maturity and its PM effectiveness by applying this research methodology. 9. Kwak, Y.H. (2010) “Meeting with Global Project Management Expert: PM is Blue Ocean (글로벌 프로 젝트경영 전문 가와 의 만남: ‘PM은 블루 오션이다!’”, Korean Project Management Association, Summer 2010, 78-82. (in Korean). 8. Kwak, Y.H. (2010) “Comparando Gerenciamento de Projectos e Seis Sigma (in Portuguese)” Revisita Mundo Project Management, Dec/Jan 2010, 8-13. 7. Ibbs, C. W. and Kwak, Y.H., (2005) “Calculating Project Management’s Return on Investment,” Projects and Profits, ICFAI University Press, March, pp. 19-33. Reprint of Kwak, Y.H. and Ibbs, C.W. (2000). “Calculating Project Management's Return on Investment", Project Management Journal, 31(2), pp. 38-47. 6. Kwak, Y.H. (1999) “University Tour: The George Washington University, Washington, DC” PROMAT (Project Management & Technology), Winter, 50-53. (in Korean). 5. Kwak, Y.H. and Ibbs, C.W. (1999) “Analyzing PM Maturity vs. Project Performance: Deriving PM/Return on Investment (ROI)”, PROMAT (Project Management & Technology), Winter, 12-15. (in Korean). 4. Kwak, Y.H. and Ibbs, C.W. (1999) “PM Maturity Benchmarking Model and its Results” PROMAT (Project Management & Technology), Fall, 12-16. (in Korean). 3. Kwak, Y.H., Ibbs, C.W. and Kim, Y.W. (1999) “A System Approach to Evaluate Quantitative Impacts of Project Management I” PROMAT (Project Management & Technology), Summer, 12-18. (in Korean). 61. Choi, J.O., Kwak, Y.H., Shane, J., and Shrestha, B.K. (2019) "Identifying Innovative Technologies and Management Approaches for UMM Industries", The 2019 ASCE International Conference on Computing in Civil Engineering, Atlanta, GA, June 17-19, 2019. 60. Choi, J.O., O'Connor, J., Kwak, Y.H. (2019) "Calibrating CII RT283’s Modularization Critical Success Factor Accomplishments" 2019 Modular and Offsite Construction, Banff, AB, Canada, May 21-24, 2019. 59. Kwak, Y.H. (2018) "Social Conflicts in Megaproject Management" The 6th International Megaprojects Workshop: Theory Meets Practice, Shanghai, China, Oct 25-26, 2018. 58. Choi, J.O., Shane, J.S., Kwak, Y.H., and Shrestha, B.K. (2018) “How can higher levels of facility design standardization be achieved in the Upstream, Midstream, and Mining Commodity sector?” 2018 Construction Research Congress, New Orleans, LA, April 2-5, 2018. 57. Kwak, Y.H. (2017) “Trends in project delivery methods research in the US” EURAM 2017, Glasgow, UK, June 21-24, 2017. 56. Kwak, Y.H. (2017) “Meet the Editors: Introducing Journal of Management in Engineering” EURAM 2017, Glasgow, UK, June 21-24, 2017. 55. Kwak, Y.H. (2017) “Meet the Editors: Introducing Journal of Management in Engineering” IRNOP 2017, Boston, June 11-14, 2017. 54. Kettunen, J. and Kwak, Y.H. (2017) “Scheduling Public Request for Proposals”, 2017 Industry Studies Conference, Washington, DC, May 24-16, 2017. 53. Kettunen, J. and Kwak, Y.H. (2016) “Scheduling Public Procurement Contracting”, 2016 Informs Annual Meeting, Nashville, TN, Nov. 13-16, 2016. 52. Keleher, J. and Kwak, Y.H. (2016) “Managing Risk and Implementing Strategy: The Importance of Leadership and Management Skills”, 2016 PMI Global Congress, San Diego, CA, Sept. 25-27, 2016. 51. Kim, K, Cho, Y., and Kwak, Y.H. (2016) “BIM-based Optimization of Temporary Structure Plans for Safety”, 2106 Construction Research Congress, San Juan, Puerto Rico, May 31-June 2, 2016. 50. Kettunen, J. and Kwak, Y.H. (2016) “Scheduling Procurement Auctions” POMS 2016 27th Conference, Orlando, FL, May 6-9, 2016. 49. Kettunen, J. and Kwak, Y.H. (2015) “Scheduling Procurement Auctions” INFORMS 2015 Annual Meeting, Philadelphia, PA, Nov. 1-4, 2015. 48. Choi, S., Han, S.H., and Kwak, Y.H. (2015) “How do Project-Based Organizations adapt to the Changing Global Environment?” International Research Network on Organizing by Projects (IRNOP) conference, London, UK, June 22-24, 2015. 47. Kwak, Y.H. (2014) “Managing Government Projects and Programs: Lessons Learned” PMI Global Congress 2014-North America, Phoenix, AZ, Oct. 26-28, 2014. 46. Kwak, Y.H., Patanakul, P, Liu, M., and Zwikael, O. (2014) “Lessons Learned from Investigating Large Government Projects and Programs” 2014 PMI Research and Education Conference, Portland, Oregon, July 27-29, 2014. 45. Sadatsafavai, H., Walewski, J., Williams, N.L., and Kwak, Y.H. (2014) “Evolution of Project Based Organization: A Case Study” 4th Conference of the International Network of Business and Management, Barcelona, Spain, June 25-27, 2014. 44. Ghosh, S., Amaya, L., and Kwak, Y.H. (2014) “Knowledge Governance Model for Successful Projects” 23rd International Management of Technology Annual Conference, Washington, DC, May 22-26, 2014. 43. Park, C. and Kwak, Y.H. (2014) “Project Ecosystem Competency Model” 23rd International Management of Technology Annual Conference, Washington, DC, May 22-26, 2014. 42. Choi, K., Ryoo, B.Y., and Kwak, Y.H. (2013). “Cluster-Driven Life-Cycle Cost Analysis Model for Transportation Infrastructure Improvement Projects.” UKC 2013, East Rutherford, NJ, August 7-11. 41. Gosh S., Kwak Y.H., and Cheerla A. (2013) “Dimensions and Codes of Good Project Governance” 11th International Research Network on Organizing by Projects (IRNOP) conference, Oslo, Norway, June 17-19, 2013. 40. Ahn, Y.H. Kwak, Y.H. and, Suk, S.J. (2013) “Organizational Transformation Strategies for Adopting Building Information Modeling in the Engineering-Construction Industry” The 5th International Conference on Construction Engineering and Project Management, Anaheim, CA, Jan 9-11, 2013. 39. Suh, M.J. Pearce, A.R., and Kwak, Y.H. (2013) “The Effect of LEED Certified Building on The Surrounding Neighborhood in New York City” The 5th International Conference on Construction Engineering and Project Management, Anaheim, CA, Jan 9-11, 2013. 38. Kwak, Y.H. (2012) “Lessons Learned from the History of Hoover Dam Project” US-Korea Conference on Science, Technology, and Entrepreneurship (UKC 2012), Los Angeles, CA, Aug 8-11, 2012. 37. Kwak, Y.H., Liu, M., Patanakul, P., and Zwikael, O. (2012) “Strategic Management of High-Risk Government Mega Projects and Programs” PMI Research and Education Conference, Limerick, Ireland, July 15-18, 2012. 36. Park, J., Kwak, Y.H., Ahn, C., Lee, S., and Pena-Mora, F. (2012) “Delivering Infrastructure Projects through the Lens of Sustainability” Production and Operation Management Society Annual Conference, Chicago, April 20-23, 2012. 35. Kwak, Y.H. and Lee. G. (2012) “Harnessing Social Media for Increased Public Engagement” NASA Project Management Challenge 2012, Orlando, FL, February 22-23, 2012. 34. Lee, G. and Kwak, Y.H. (2011) “A Maturity Model for Technology-Enabled Open Government”, Pre-ICIS eGovernment Workshop, Shanghai, China, December 4, 2011. 33. Ghosh, S., Boswell, J., Kwak, Y.H., and Skibniewski, M. (2011) “Risk Governance Framework for Enterprise Wide Application Implementations”, IEEE International Technology Management Conference (ITMC)-2011, San Jose, CA, June 27-30. 32. Ghosh, S., Negahban, S., Kwak, Y.H., and Skibniewski, M. (2011) “Impact of Sustainability on Integration and Interoperability between BIM and ERP- A Governance Framework”, IEEE International Technology Management Conference (ITMC)-2011, San Jose, CA, June 27-30. 31. Lee, G. and Kwak, Y.H. (2011) “Open Government Implementation Model: A Stage Model for Achieving Increased Public Engagement” 12th Annual International Conference on Digital Government Research (dg.o 2011): Digital Government Innovation in Challenging Times, College Park MD, June 12–15 2011. 30. Young, L., Valerdi, R., Farr, J., and Kwak, Y.H. (2011) “An Approach to Estimate the Life Cycle Cost and Effort of Project Management for Systems Centric Projects”, 2011 International Society of Parametric Analysts (ISPA) and the Society of Cost Estimating and Analysis (SCEA) Conference, Albuquerque, NM, June 7-10, 2011. 29. Choi, K., Lee, E.B., Kwak, Y.H., and Pyeon, J.H. (2011). “Optimal Incentive/Disincentive Predictive Model for Transportation Projects” 2nd International Conference on Transportation Construction Management, Federal HighwayAdministration, Orlando, FL, Feb. 7-10, 2011. 28. Choi, K. Kwak, Y.H., and Yu, B. (2010) “Quantitative Model for Determining Incentive/Disincentive Amounts through Schedule Simulations”, 2010 Winter Simulation Conference, Baltimore, MD, Dec. 5-8, 2010. 27. Kwak, Y.H., Cioffi, D.F., and Khamooshi, H. (2010) “Revamping a Curriculum: GWU's Modern Comprehensive M.S. in Project Management (in Two Delivery Systems), 2010 Annual Institute for Operations Research and the Management Sciences (INFORMS) meeting, Austin, TX, Nov. 7-10, 2010. 26. Kwak, Y.H., Choi, K., and Park, J. (2010) “Impacts of Change Orders on Project Performance”, 2010 Annual Institute for Operations Research and the Management Sciences (INFORMS) meeting, Austin, TX, Nov. 7-10, 2010. 25. Young, L., Farr, J., Valerdi, R., and Kwak, Y.H. (2010) “A Framework for Evaluating Life Cycle Project Management Costs on Systems Centric Projects”, American Society for Engineering Management 2010, 31st Annual Conference, Rogers, AR., October 13-16, 2010. 24. Kwak, Y.H. (2010) “Project Portfolio Management (PPM) - Strategic and Operational Agility through Projects” Project Management Institute Research Conference, Washington, DC, July 11-14, 2010. 23. Kwak, Y.H. (2009) “Public-Private-Partnership in Infrastructure Development” Professional Development Workshop, 2009 Annual Meeting of the Academy of Management, Chicago, Aug 7-11, 2009. 21. Anbari, F.T. and Kwak, Y.H. (2008) “Is there a Future for Project Management in the Allied Management Disciplines?” 22nd International Project Management Association World Congress, Rome, Italy, Nov 9-11, 2008. 20. Kwak, Y.H. and Anbari, F.T. (2008) “Project Management Research Trends of Allied Disciplines” 2008 PMI Research Conference, Warsaw, Poland, July 13-16, 2008. 19. Kwak, Y.H., Wetter, J., and Anbari, F.T. (2006) “Business Process Best Practices: Project Management or Six Sigma?” 2006 PMI Research Conference, Montreal, Canada, July 16-19, 2006. 18. Anbari, F.T. and Kwak, Y.H. (2005) “Six Sigma Programs and Proactive Risk Management” Project Management Challenge 2005, Second Annual NASA Project Management Conference, College Park, MD, March 22-23, 2005. 32. Kwak, Y.H. (2018) "Publish or Perish: Journal Paper Publication Strategy" Nanjing University, Nanjing, China, Oct 29, 2018. 31. Kwak, Y.H. (2018) "Publish or Perish: Journal Paper Publication Strategy" Tongji University, Shanghai, China, Oct. 27, 2018. 30. Kwak, Y.H. (2018) "Publish or Perish: Journal Paper Publication Strategy" Texas A&M University, College Station, TX, Sept 17, 2018. 29. Kwak, Y.H. (2018) “Publish or Perish: Journal Paper Publication Strategy” University of Virginia, Charlottesville, VA, Nov 3, 2017. 28. Kwak, Y.H. (2017) “Urbanization and Opportunities in Project-Driven Industry” Yonsei University, Seoul, Korea, July 11, 2017. 27. Kwak, Y.H. (2017) “New Emerging Trends in Project-Driven Industry” Seoul National University Engineering Project Management Program, Seoul, Korea, June 30, 2017. 26. Kwak, Y.H. (2016) “Project Management Strategies” Seoul National University Engineering Project Management Program, Seoul, Korea, May 20, 2016. 25. Kwak, Y.H. (2016) “Large Scale Government Project Success Strategy” Korean Institute of Construction Engineering and Management, Seoul, Korea, May 18, 2016. 24. Kwak, Y.H. (2016) “Journal of Management in Engineering Publication Strategy” Korean Institute of Construction Technology, Seoul, Korea, May 18, 2016. 23. Kwak, Y.H. (2016) “Journal of Management in Engineering Publication Strategy” Yonsei University, Seoul, Korea, May 17, 2016. 22. Kwak, Y.H. (2016) “Information Technology in Engineering-Construction-Infrastructure” Hanyang University, Seoul, Korea, May 17, 2016. 21. Kwak, Y.H. (2014) “Best Practices for Mega Project Management” Seoul National University Engineering Project Management Program, Seoul, Korea, July 18, 2014. 20. Kwak, Y.H. (2014) “Lessons Learned from Investigating Large Government Projects and Programs” Yonsei University, Seoul, Korea, July 15, 2014. 19. Kwak, Y.H. (2014) “Lessons Learned from Investigating Large Government Projects and Programs” University of Seoul, Seoul, Korea, July 14, 2014. 18. Kwak, Y.H. (2013) “Strategies for Sustainable Infrastructure Development, Management, and Evaluation” First International Workshop of Green Infrastructure Technology for Climate Change, Yonsei University, Seoul, Korea, May 30, 2013. 17. Kwak, Y.H. (2013) “Strategies for Sustainable Infrastructure Development” Construction Economics Research Institute of Korea (CERIK), May 28, 2013. 16. Kwak, Y.H. (2013) “Project Financing and Sustainable Construction Project Management” Seoul National University Engineering Project Management Program, May 23, 2013. 15. Kwak, Y.H. (2012) “Engineering-Infrastructure Project Management Strategy” POSTECH, Pohang, May 31, 2012. 14. Kwak, Y.H. 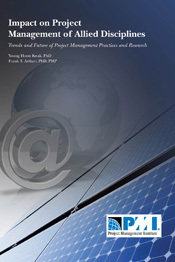 (2012) “Engineering-Infrastructure Project Management Strategy” KAIST, Daejon, May 29, 2012. 13. Kwak, Y.H. (2011) “Global Project Financing Trends and Strategies” Construction Economics Research Institute of Korea (CERIK), May 31, 2011. 12. Kwak, Y.H. (2011) “Applications and Trends of Earned Value Management Practice in US Government” Korean Project Management Association (KPMA), May 30, 2011. 11. Kwak, Y.H. (2011) “New Trends and Strategies of Project Management Practice: Project Financing, Earned Value Management, and Business Analytics” Yonsei University, May 27, 2011. 10. Kwak, Y.H. (2011) “Trends and Future of Project Management Research, Education, and Practice” Korean Project Management Forum, May 26, 2011. 9. Kwak, Y.H. (2011) “Strategies and Momentum of Global Project Management Market” HanmiGlobal, May 24, 2011. 8. Kwak, Y.H. (2011) “Project Financing and US PPP Transportation Projects” Seoul National University Engineering Project Management Program, May 20, 2011. 7. Kwak, Y.H. (2011) “New Trends and Future of Project Management: Maturity Model, Mega-Projects, and Future of PM” Seoul National University Engineering Project Management Program, Jan 28, 2011. 6. Kwak, Y.H. (2010) “Project Management and its Allied Disciplines: Past, Present, and Future”, Yonsei University (5/28/2010) and Seoul National University (6/1/2010), Seoul, Korea. 5. Kwak, Y.H. (2010) “The Future of Construction Management and Project Management”, Yonsei University Civil Engineering 50th Anniversary Symposium, May 27, 2009, Seoul, Korea. Keynote Speech. 4. Kwak, Y.H. (2009) “Project Management Maturity Model: Measuring PM Maturity” Department of Civil Engineering, University of Maryland, Nov 12, 2009. 3. Kwak, Y.H. (2009) “Project Management and its Allied Disciplines”, Master of Project Management Program, Project Management Community of Practice Conference, Penn State, Erie, Aug. 18, 2009. Keynote Speech. 2. Kwak, Y.H. and Anbari, F.T. (2008) "Is there a Future for Project Management in the Allied Management Disciplines?” George Washington University School of Business, Oct 24, 2008. Departmental Seminar. 9. Featured in the article “Earned Value Management: Insights from NASA”, PMI Community Post, Mar 12, 2012. 8. Featured in the article “An Overlooked Value Driver”, CFA Magazine, Nov/Dec 2011, p.31-33. 7. Featured in the article “Government 2.0: An Implementation Model,” Kogod Now, Fall 2011, pp. 29-31. - “Big Blue Guide to Implementing Open Government,” GovFresh, March 17, 2001. - “IT Problems are Hindering Agency Transparency Initiatives,” Fierce Government IT, Feb. 3, 2011. - “Agencies Face Challenges in Delivering Open Government,” NextGov.com, Feb. 1, 2011. - “Agencies face problems opening up government,” Federal Computer Week, Jan. 31, 2011. 3. Featured in the article “School of business will record classes”, GW Hatchet, Sep. 18, 2008. 2. Featured in the article “New F Streetresidence hall to cost $75 million”, GW Hatchet, Sep. 2007. 1.Featured in the article "Project Management Maturity and ROI" Project Management Institute New York City Chapter Newsletter, April 2002, Vol.4 (4). 2. Ibbs, C.W. and Kwak, Y.H. (1998) "US Yokosuka Naval Complex Traffic and Parking Study." Final Report, Department of the Navy, Naval Facilities Engineering Command, Contract No. 62836-97-Q-1135, Feb.
1. Kwak, Y.H. and Ibbs, C.W. (1997). "A Systematic Approach to Evaluate Quantitative Impacts of Project Management (PM)." Technical Report No. 97-04, Construction Engineering and Management Program, Department of Civil Engineering,University of California at Berkeley, May. Last Updated: February 5, 2019. YHK. 2016 JME Impact Factor broke 2.0!